Home » avengers age of ultron , marvel cinematic universe , marvel comics , movie reviews , movies » Saw AVENGERS: AGE OF ULTRON last night! Saw AVENGERS: AGE OF ULTRON last night! Okay, it's not a "perfect" movie. I for one would have appreciated more of Ultron's legendary Oedipus complex between himself and his "father" (who in the Marvel Cinematic Universe continuity is Tony Stark). But those little problems aside, Avengers: Age of Ultron is a gob-smockingly powerhouse of a ride comin' at ya, and in this viewer's opinion it's more than the ideal movie to kick off a summer season. So we caught it last night during its preview showings (it officially opens today). "We" being longtime friend/artistic collaborator Melody Hallman Daniel who's been visiting here for the past week, her service dog Sasha, and Yours Truly. After what seemed like a dozen trailers (alas! the Star Wars: The Force Awakens trailer was not one of them, and if it had been I was going to stand up wave my hands frantically while screaming "YES YES YES!!"). The film starts with our heroes taking out a Hydra installation in Eastern Europe, the prize possession of which is that pesky scepter that Loki has been using in previous entries of the franchise. The team brings it back to Avengers headquarters, where Tony Stark asks for some time to examine it. And so he begins to mess with things beyond even his understanding and which should not be tampered with. Of course, this can't end well. Avengers: Age of Ultron, I thought, was much like the story of Frankenstein. About a new creature brought about either by design or accident that grows beyond the control of its creator. In this case, said creature is determined to become God by wiping out all humanity, to say nothing of evolving itself. And so it falls to the Avengers to stop him/it. I thought that in some ways this was a stronger ensemble film than The Avengers was in 2012. In this movie, everyone gets their chance to shine (especially Hawkeye, who has been holding out on some things from his teammates). There is a greater sense of depth here among our heroes. If only there had been more screen time to devote to that... but for a comic book film, it's still fine. I enjoyed it immensely. So did Melody. And so did Sasha. Yes, Sasha watched it and she communicated to Melody that she thought it was good, but also that she didn't like the bad guy. Which from a dog's perspective means that she thought that Ultron (played with brilliant menace by James Spader) was a great bad guy. Maybe Sasha should have her own blog reviewing movies: according to Melody she seems to have a great sense for this sort of thing. 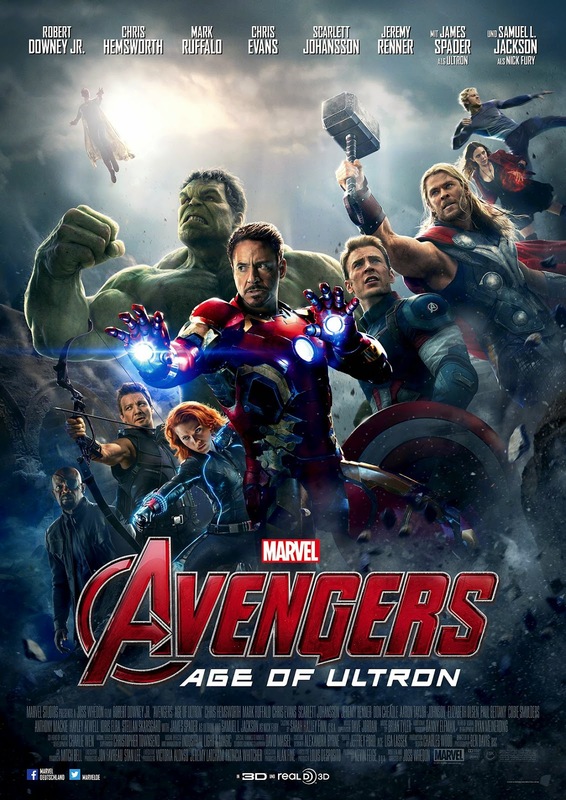 Anyhoo, if you want a great popcorn flick to take your mind off of the even crazier stuff happening all around us, as well as a solid new entry in the Marvel Cinematic Universe, you'd be doing yourself a heaping disfavor if you didn't catch Avengers: Age of Ultron at least once during its theatrical run. I give it two thumbs up. Melody gives it two thumbs up. Sasha gives it a high five and a tail wag. By the way, it goes without saying with this sort of thing: don't leave the theater when the credits begin to roll. There is one more surprise left that seems to be playing into the larger game that Marvel and Disney are taking this franchise.